Counter terror police are continuing to question a man after a suspected far-right inspired attack in which a 19-year-old man was stabbed in Surrey. The attacker allegedly rampaged through Stanwell with a baseball bat and knife, hurling racist abuse on Saturday night. Police said the teenage southern European victim "may have been targeted due to his ethnic appearance". He underwent surgery for serious hand injuries on Sunday night and has since been discharged. Counter Terrorism Policing South East (CTPSE) said a warrant for further detention was granted earlier by Westminster Magistrates Court, allowing police to detain the suspect until 23 March. 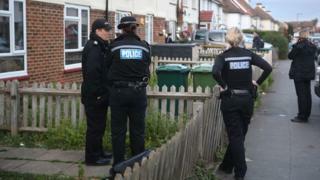 Officers were called at about 22:30 GMT on Saturday to Viola Avenue where vehicles had been damaged. The victim went to a nearby McDonald's for help and was taken to Ashford Hospital before being been transferred to St George's Hospital for specialist treatment. Det Supt Nigel Doak, from Counter Terrorism Policing South East, said: "Whilst this investigation remains in the early stages, it has continued to show the hallmarks of a terrorist event. "It is believed that the offender made racial comments and statements, promoting extreme far right views before carrying out the attack. "We believe the victim, a 19-year-old southern European man, may have been targeted due to his ethnic appearance." He said police were committed to tackling "all forms of toxic extremist ideology" and called for any witnesses to the incident to get in touch. The attack happened in the wake of the New Zealand mosque shootings, prompting Home Secretary Sajid Javid to "reject the terrorists and extremists who seek to divide us". Have you been personally affected by this story? Email haveyoursay@bbc.co.uk.